Registration is open! Please visit the Registration webpage to register for the conference. HCOMP offers a free press pass for credentialed members of the press. To request a press pass, please contact AAAI at hcomp16@aaai.org or telephone +1 (650) 328-3123 (USA). HCOMP 2016 will be held in Austin, Texas, the USA's 11th largest city and a popular tourist destination. The conference will take place on campus at the University of Texas at Austin. The main conference & workshops will take place at the primary venue, the AT&T Executive Conference Center. The Tutorial & Doctoral Consortium will take place at the School of Information (see location & directions to the iSchool). Getting to Austin. Austin-Bergstrom International Airport (AUS) is a major airport with many flights each day. Other cities nearby with major airports include: San Antonio (1.75 hours by car), Dallas (3.5 hours by car), and Houston (3.5 hours by car). Local Transportation. A taxi cab from the airport to the venue will cost approximately USD $25 one-way. SuperShuttle offers shared van service at a slightly lower rate. Uber and Lyft do not operate in Austin, but other MobileApp services do, including RideAustin (non-profit) and Fasten. Hotel Reservations (Deadline: October 3, 2016, 5pm CDT). To reserve your room at the discount conference rate of $185/night (single/double), please use the conference's dedicated booking website. Note: Due to limited room availability at the conference hotel on the evening of Saturday, October 29th, the conference booking link will only permit Doctoral Consortium participants to reserve rooms for that evening. Consequently, all other conference attendees should select Sunday, October 30th (or thereafter) as the first night of their stay when using the conference booking link. Additional nights can also be booked directly from the hotel at its standard room rates. Finding others to share with. You can find roommates to share your hotel room, taxi, or car rental with by going to conferenceshare.co. Creative Halloween costumes are encouraged but completely optional. 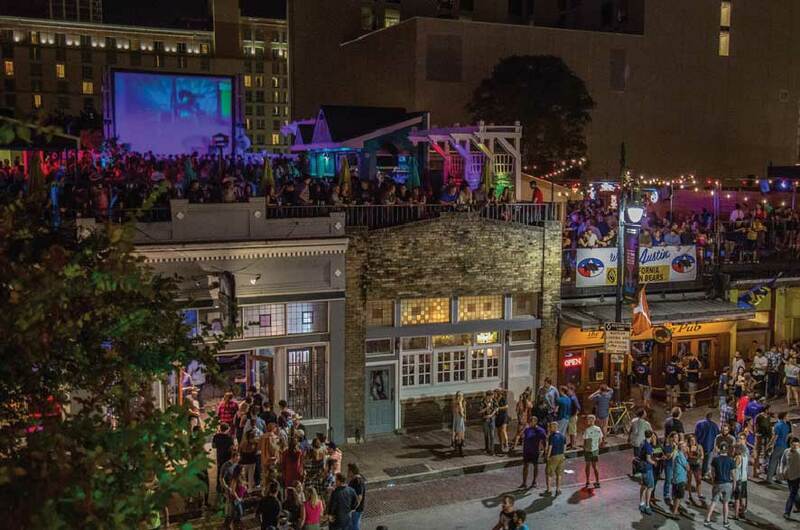 After the reception, consider going to see Austin's famous Halloween on 6th Street. Want to rent a Halloween costume? Austin's Lucy in Disguise has an amazing selection to choose from. Thanks to generous sponsorship from Spare5, a special offsite reception will be held at Maggie Mae's, a famous local venue with the largest rooftop bar on 6th Street. Maggie Mae's boasts several types of entertainment, including a sports bar, complete with big screens for the game, an authentic English Pub suited for conversation, a New Orlean's style courtyard beneath the stars, and three different stages outfitted for live music. 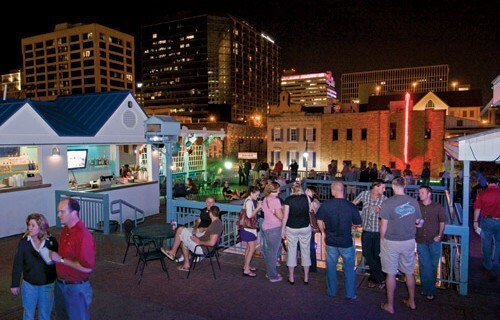 Attendees will have exclusive use of Maggie Mae's Rooftop Deck East that overlooks 6th Street and offers a panoramic view of Austin's skyline. Attendees will also have exclusive access to Gibson Lounge. Sponsored by Gibson Guitars, the newly remodeled Gibson Lounge showcases some of the iconic guitarists who have played Gibson Guitars through the decades. All HCOMP-16 technical conference registrants will receive free admission. Appetizers and two drink tickets per person will be provided. Attendees will have the option of purchasing dinner or additional drinks on their own. Shuttle service will be provided from the AT&T Center departing at 6:30pm. Return shuttle service will be available on a continuing basis. The last departure from Maggie Mae's will be at 10:00pm. Austin, TX is known for its entrepreneurial spirit, celebration of personal freedom, vibrant music, film and art scene, and a thriving economy thanks to technology, engineering and health care industries. Throw in a glittering lake running through the center of the city, big blue skies, gleaming Texas sunshine and the natural beauty of the surrounding Hill Country. Add an open-minded sense of community, a serious commitment to breakfast tacos and a deep appreciation for all kinds of people, and you've got Austin, TX. Plan your trip to Austin today. Saturday, October 29, 2016: Arriving early? Watch UT Football take on Baylor. Thursday, November 3, 2016: Staying for workshops? Consider stopping by First Thursday that evening on South Congress. The massive pink granite dome rising above Central Texas has drawn people for thousands of years and has been described as Texas's "Ayer's Rock".